Following the lawsuit issued by Magen David Adom against United Hatzalah, United Hatzalah, the smaller volunteer and free emergency medical service organization, issued a letter of defense to the court responding to accusations of slander from Magen David Adom. In the letter of defense submitted to the District Court of Tel Aviv, United Hatzalah gave numerous examples that are representative of the trend in which Magen David Adom withheld addresses and other pertinent medical information in order to prevent United Hatzalah first responders from reaching patients in need of emergency medical care. One of these instances resulted in the death of a woman. In another instance, an older man suffering from severe shortness of breath and residing in a hostel continued to suffer while a volunteer from United Hatzalah with oxygen and full medical gear was on the street but was not given the address of where to find the person in need. An additional case saw Magen David Adom refuse to give the address of a woman in active labor, to a volunteer EMT nearby. United Hatzalah told the court that over the past number of years, Magen David Adom has continuously refused to give over vital information regarding the whereabouts of these medical cases and more and that the refusal to do so is endangering lives. The letter of defense states that Magen David Adom has continuously and purposefully refused to give over this information even when the volunteers from United Hatzalah were very close to the incidents taking place and able to provide medical intervention to those in need. The cases included in the letter of defense were all incidents that took place within the last two years. In 2018 in Be’er Sheva, United Hatzalah volunteer EMT Ariel Fahima received an alert regarding a medical incident on Chaviva Reik St. while he himself was located on the same street. Fahima, following protocol, called the dispatch center of Magen David Adom in order to receive the exact address of the incident in order to arrive at the location as fast as possible and provide medical care. Much to his dismay and surprise, the dispatcher for Magen David Adom and her supervisor said that they were unable to pass on the information regarding the incident because he was still not connected to the application that was issued by the Health Ministry. Fahima pleaded with the dispatchers stating that he was on the street where the incident was taking place, but his pleas went unheeded. The MDA dispatchers hung up the phone. It is the claim of United Hatzalah that the dispatchers acted against the agreed protocols set forth by the Health Ministry who have instructed MDA and their dispatch to give over all of the pertinent information regarding an emergency, including via telephone, until all of the volunteers from both organizations were added to the Health Ministry’s application. In a separate incident from 2017 on Bialik St. in Ashdod, United Hatzalah volunteer EMT Daniel Bokovza received an emergency alert regarding a woman who was suffering from severe shortness of breath and required immediate medical intervention. Bokovza arrived quickly at Bialik street. However, when he called MDA’s dispatch in order to ascertain the exact address of the medical emergency, the MDA dispatchers said that there was no such incident on Bialik St. in the city. Later that day, Bokovza discovered in an indirect fashion, that the woman who he had rushed out to treat had later died because she didn’t receive emergency medical assistance in time. The family members of the woman claim that they waited for more than 25 minutes for the ambulance to arrive. In a third incident detailed in the letter of defense, United Hatzalah volunteer Shalom Zohar form Kfar Saba received an alert regarding an elderly man who suffered from shortness of breath in the hostel on Derech Kedumim Street where he was staying. When Zohar arrived at the location, it was evident that the complex was large and had many floors and rooms. There was no one at the hostel who could give Zohar a location of where the man was staying. Zohar called MDA dispatch in order to receive the exact location and find the elderly man in need of care. However, the MDA dispatcher refused to give him the details because he did not receive the information about the incident from his application. Zohar pleaded with the woman at MDA dispatch to send him the information over the phone or application because he was at the location and able to provide assistance. The dispatcher continued to refuse claiming that she is following the protocols of the Health Ministry. Another incident occurred in Jerusalem, in which United Hatzalah volunteer EMT Avi Tennenbaum reported that a woman was giving birth in her home on Mirsky St. and that he received the alert because he was on the street at that time. He called Magen David Adom dispatch in order to receive the exact address of the woman giving birth. The MDA dispatcher refused to give the information over and insisted that Tennenbaum first confirm that he received a text message to the phone that he called MDA from. In spite of the dispatcher’s insistence that he sent the text message with the code to Tennenbaum three times, Tennenbaum never received the message and the dispatcher, therefore, refused to give him the information. Tennenbaum reiterated that he was on the street and able to assist the woman in her active labor but the dispatcher refused to give the information. 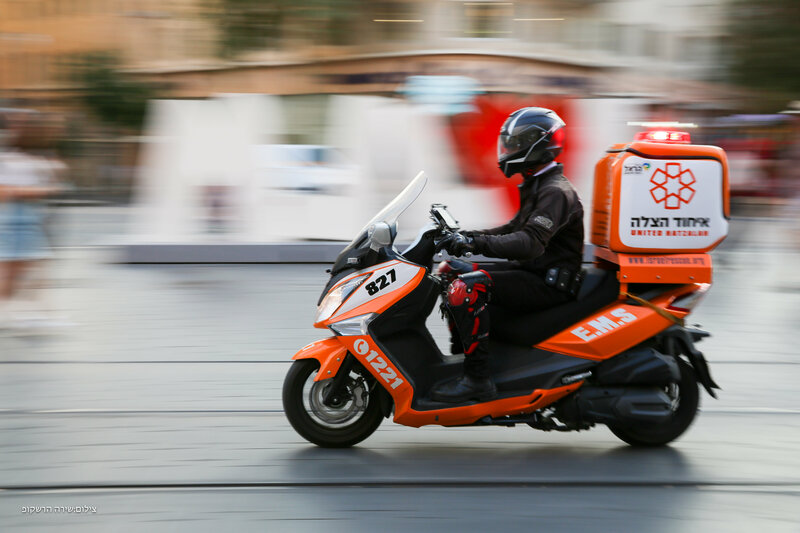 United Hatzalah, which is being sued for 2.3 million shekel by Magen David Adom also stated in their defense letter that MDA is misleading the public with regards to how fast their response times are, claiming that they are among the fastest response times in the world and that their average response time is between eight and nine minutes. However, reality shows a different picture. This entry was posted in Uncategorized and tagged court, EMS, EMT, first responder, Israel, Lawsuit, Magen David Adom, United Hatzalah. Bookmark the permalink.